While the parking can be tight, the middle north jetty dive site on the Barview north jetty is a good place to go diving if you want to spearfish or go crabbing. The current is usually too strong to stop and look around for very long but the hunting is good. The Tillamook County Barview Jetty Park and Campground is very close and could serve as a nice home base for a few days of diving around Tillamook Bay. The main highlight at this site is spearfishing and crabbing. The tidal exchange produces too much current here to go slow and look at all of the micro marine life. Barview, Oregon is the closest unincorporated town. Garibaldi is the closest larger town and Tillamook is a bit further south. Follow signs from US101 for the Tillamook County Barview Jetty Park. Follow Jetty Road west and look for the left-hand (southerly) turn. If you go too far, you’ll end up at the end of the road and the outer north jetty dive site. There is limited parking at this dive site. We have seen this site’s parking full on busy weekends. The last time we went here, we did not pay to park although that may change. The middle north jetty dive site at Barview is a good place to go spearfishing and crabbing. The site runs generally east-west along the north jetty. Keep close to the jetty and don’t stray into the shipping channel. This is a difficult jetty entrance. We highly recommend that you walk the entrance before you don your SCUBA gear to make sure you have a solid plan for where you want to crawl over the jetty. It’s a good idea to take something to mark your exit point so that you can find it easily when you surface. A dive flag, like the one we recommend on our Gear We Use page, works as a good marker and lets nearby boats know that you’re along the jetty. You WILL find current at this site. Depending on how the waves are coming into the coast, you may encounter surge and surf as well although it is rare to get much surge here and rarer to have surf. Visibility is normally 15 feet on a good day. The best visibility is at high tide. If a big storm has been dumping rain above Tillamook Bay, visibility will be reduced. We have seen water temperatures here between 48 and 57F depending on the time of year. 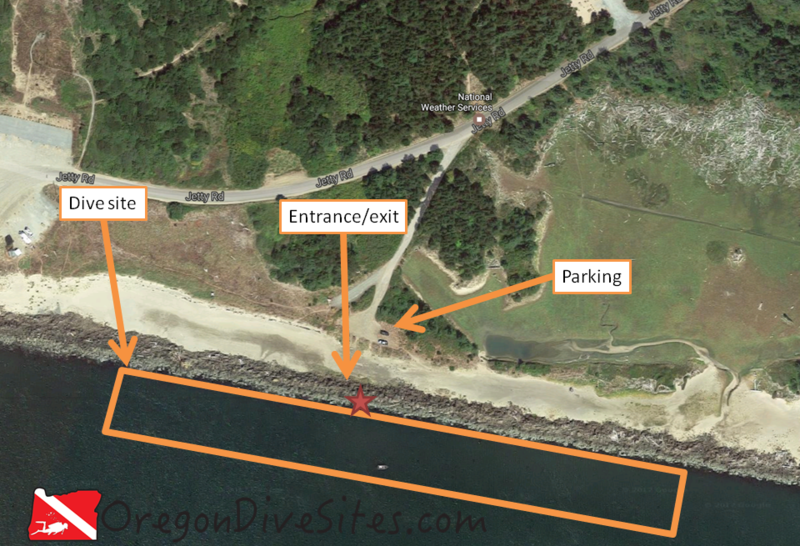 The middle north jetty dive site can be dived at any time throughout the year. We usually like going here during crabbing season though. At high tide, you can find 40 feet of water along the middle north jetty. We suggest having advanced open water training and be comfortable with climbing over jetties. This site always has a good current so be prepared to dive in strong current. Some people will do this as a drift dive and come out either at the inner north jetty dive site or the outer north jetty dive site. We think this is an intermediate dive due to the current and the jetty entrance. It’s about 75 feet from the parking lot to the jetty. No surface swim is needed as long as you’re decent with navigation. The current here can really rip. We usually prefer to dive this site when the tide is still coming in and exit just after slack tide. There used to be a local dive shop in Tillamook although we aren’t sure if it is still in business. Please let us know if you have up to date information! There are restaurants up and down US101 near this dive site. If you have any favorites, please let us know! The Tillamook County Barview Jetty Park has a good campground with RV sites, tent sites, and cabins for rent. We haven’t tried any of the hotels in the area so please let us know if you know of one that is SCUBA diver friendly!